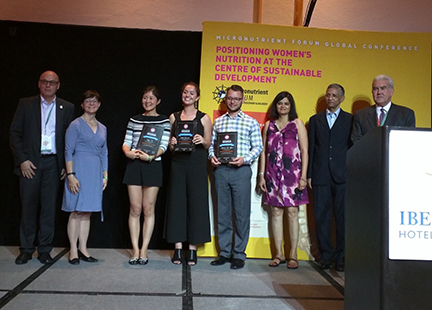 Notre Dame doctoral candidate, Nicholas Myers, came second in an elevator pitch contest at the Micronutrient Forum 2016 global conference in Cancun, Mexico. The Micronutrient Forum aims to be a global catalyst and convener for sharing expertise, insights, and experience relevant to micronutrients in all aspects of health promotion and disease prevention. It brings together researchers, professionals, students, organizations, and stakeholders to converse and collaborate in order to end malnutrition worldwide. The particular focus of the 2016 global conference was the positioning of women’s nutrition at the center of sustainable development. The elevator pitch competition was sponsored by humanitarian nutrition think tank, Sight and Life, whose work aims to eradicate malnutrition among women of childbearing age and children. Participants in the competition were tasked with precisely and persuasively articulating their ideas on micronutrient innovation and entrepreneurship to a panel of judges and the conference audience in under a minute. An integral component of a young scientist’s career is pitching their ideas to secure research and investment funds and the elevator pitch competition gave participants the opportunity to demonstrate and sharpen their skills. Originally published by Chontel Syfox at science.nd.edu on November 28, 2016.